A coup d’état manufactured in the United States is underway in Venezuela with Juan Guaido, president of the Venezuelan National Assembly self-proclaimed as interim president. The US rushed to recognise Guaido challenging the legitimacy of the democratically elected President Nicolas Maduro who was sworn in for a second six-year term on January 10, 2019, was elected with more than six million votes on May 20, 2018. Some countries like Australia have followed the US dictates and recognise Guaido as the interim president of Venezuela. Solidarity groups in Australia called for rallies last week in support of President Maduro and to demand that the Morrison Government withdraw its recognition of the coup president. The Australia Venezuela Solidarity Network (AVSN) and the Australia-Cuba Friendship Society (ACFS WA) held a speak-out on Friday February 1 outside the Elizabeth Quay Station in Perth. Some 60 activists gathered with banners, placards and flags in support of President Maduro and calling for the Australian government to withdraw the shameful recognition of the coup president Guaido. Protesters were confronted by a small group of right-wing Venezuelans who expressed support for the US coup and the Australian recognition of their puppet president. They filmed and photographed all present, aggressively confronting people. During the speeches the members of the violent right-wing group chanted “go to Cuba” and “death to all communists”. It clearly shows the intolerance and the lack of political will to resolve their differences. The Communist Party of Australia has issued a statement in solidarity with President Nicolas Maduro and the Bolivarian Republic of Venezuela. 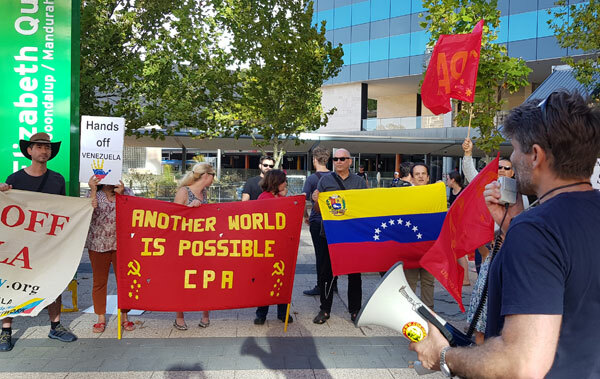 On January 23, to mark the international day in solidarity with the people of Venezuela and President Maduro, the CPA branch in Western Australia rallied in front of the US Consulate on Adelaide Terrace, Perth. We stand with President Maduro and the Bolivarian revolution. We demand the Australian government withdraw recognition of the coup puppet president.